This delightful video demonstrates the capabilities of young children and the satisfaction they experience when engaged in real work. Yes it's shot at a Montessori centre in Sweden however that's really irrelevant, the activity can be replicated anywhere. Even more importantly the principle of real work is easily established at home. 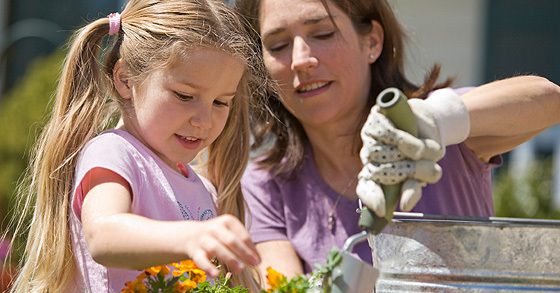 Real work, like setting the table for a meal, watering plants, washing and cutting fruit and vegetables, washing socks, hanging out washing or cleaning and a million other things, is exactly what your child wants (and needs) to do. If these activities are set up for the child in a way which gives the greatest possibility for success your child will gain valuable skills, experience immense satisfaction and an understanding of their own capabilities which in turn builds confidence and self-esteem. Getting the right equipment and an appropriate work space along with a clear demonstration of the activity is necessary to enable your child to experience success. If you are able do this the rewards for your little one (and for you) will be immense. Here's one example of how to set up an activity. 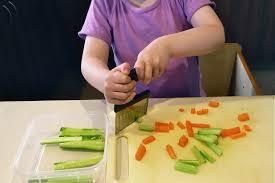 If your child is interested in helping prepare dinner you can easily set up a vegetable peeling and cutting activity. Where is the child to work? In the kitchen with you or at their table? If it's in the kitchen what will the child stand on to work safely at bench height? What will you use to designate the child's work space? 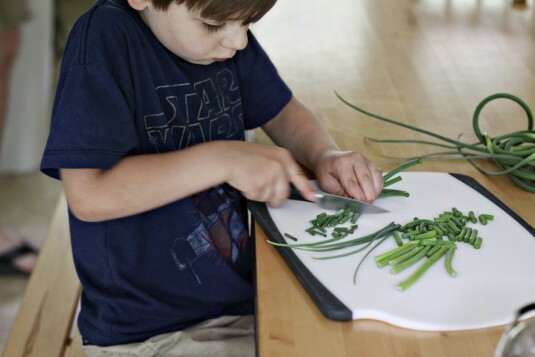 A vinyl mat works well for both the kitchen and the child's table. Differentiate between mats for food prep and other activities such as craft. 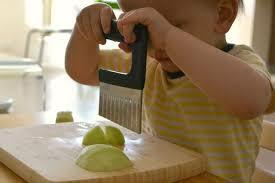 Buy a peeler which is a suitable size for the hand of your child and make sure it peels efficiently. Choose a knife or a chopper (one which uses 2 hands is often preferred by parents, available on line), make sure it is effective. A chopping board, a bowl for scraps and a bowl for prepared vegetables. A sponge to clean the bench or the table after finishing the task. Colour code your sponges so ones used in food preparation are a different colour to those used for craft. An apron if you want your child to wear one. A tray to store all of these things on and a designated place to store the tray. This can be in a particular cupboard in the kitchen or on a shelf in the child's work area. If practical, colour code all items for one particular activity. Break the activity into steps (e.g.don't introduce both peeling and cutting at the same time, wait until one is mastered then introduce the next) and teach each step by demonstrating, this includes cleaning up and when ready washing up and putting things back in their designated place. 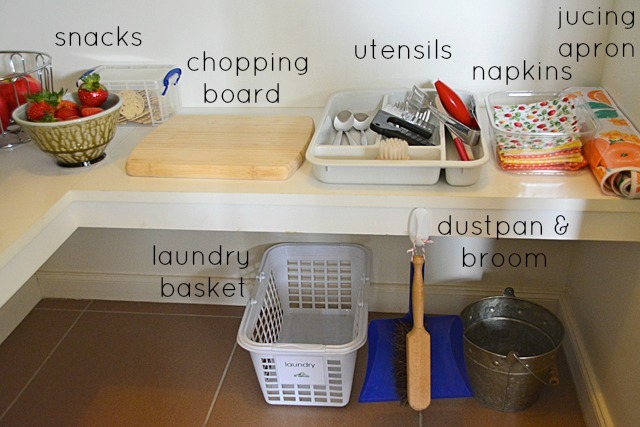 This seems like a lot but once you get the things you need, trays, sponges, child-sized utensils (available on line) and think out your storage system you will be able to set up several activities in a short-space of time. Always make sure you have enough time to demonstrate the activity before putting it on the shelf. If I can be of help, give me a call on 0403 226 733. Good luck, let me know how you get on. Newer PostIt's never too early, babies just love books! Here is a list of other posts, grouped under topics which may interest you. Apr 16, 2019 Your kids are bored? Fantastic! Mar 6, 2019 Are you tired of being surrounded by mess? Mar 5, 2019 How to give your child what they really crave, calm simplicity. Sep 4, 2018 Families do well when there is consistency, order and security. Mar 21, 2017 Happier, calmer, more joyous children. Feb 21, 2017 The world is a wonderful, beautiful place - help me see it. Feb 16, 2017 Make a place for me - please! Sep 13, 2016 Help your child blossom this spring. Aug 25, 2016 Parents, you're in charge. Jun 23, 2016 Dreading school holidays? It's your golden opportunity to evaluate. May 30, 2016 It's never too early, babies just love books! May 2, 2018 Want to nurture concentration? Here's how. Jul 19, 2017 The key to enjoyable outside play, whatever the weather. May 2, 2017 For children, real beats pretend every time. Sep 16, 2016 The joy of rain! Aug 31, 2016 How to get kids to listen better. Aug 20, 2016 "Have fun" each and every day. How is that even remotely possible? Jul 24, 2016 Resilience - what is it, what fosters it in a child and what inhibits it? Nov 7, 2018 Do parents expect too much? Nov 6, 2018 Get real! Do parents expect too much? Jul 9, 2018 What does it mean when Montessori talks about the work of the child? Mar 6, 2018 Making changes to be a better parent is not easy, but it's much easier with support. Apr 3, 2017 If you adjust your expectations, your children will be happier - and so will you.